Being stranded on the side of the road as traffic flies by mere feet away is scary. It’s a situation made even worse if you’re not traveling at all times with an emergency kit in the vehicle. Stocked with essentials for both the vehicle and its passengers, an emergency kit can help get you back on the road again, or at the very least, make the time spent waiting for assistance a little more bearable, and safer. Snow, ice, and mechanical breakdowns top the list of headaches that force drivers to take an unexpected detour to the shoulder, as do traffic delays that can last several hours when the road is closed because of an accident. Regardless of the reason behind the delay, having an emergency kit onboard can be a lifesaver – literally. Here are the basic elements every prepared driver should have in their kit and in their vehicle. Jumper cables – a dead battery can often be remedied with jumper cables hooked to a running vehicle, delivering enough charge to start the engine. Flares or reflective safety triangles – alerting other drivers to an accident or breakdown is easy using these devices placed at intervals behind the stopped vehicle. Sand or kitty litter – help wheels spinning on snow and ice regain traction by placing sand or kitty litter under them, providing enough grip to get back onto a more stable surface. Small shovel – compact ones designed for being stored in a vehicle don’t take up much room and are useful for digging snow from around a stranded vehicle. Flashlight – make sure it has extra batteries, or better yet, choose one that is hand cranked to deliver power. Duct tape and hand tools – even if you’re not a master mechanic, they’re useful in fixing a variety of minor problems, and if another driver who does have mechanical knowledge stops to assist. Blankets – are a must-have to protect passengers from below-freezing temperatures when a breakdown occurs during winter in colder climates. Water and Snacks – while they may be just a convenience during a short roadside stint, they quickly become lifesavers in an extended emergency situation in the desert heat or mountain snows. Portable cell phone charger – a mechanical issue could prevent the vehicle from being able to charge a cell phone. Instead, carry a portable battery pack designed for just such a purpose, and remember to keep a spare phone charging cord in the vehicle. First aid supplies – minor abrasions from a playground fall to serious injuries suffered in a vehicle collision can be treated with the supplies in a well-stocked first-aid kit until professional medical attention is available. While vehicle reliability and collision-prevention features are steadily on the rise and help lower the odds of being stranded on the side of the road, severe weather events always lurk and threaten to impede travel. The bottom line is to always be prepared. 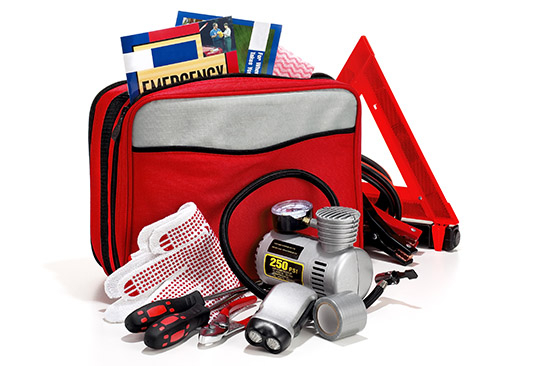 Start by assembling or purchasing a roadside emergency kit and keeping it in your vehicle.